Sony UP-D25MD is the successor of the UP-D23MD. Our objective was to manufacture a user friendly printer, to improve image quality, (up to 423 DPI, colour adjustment software), and to provide a large choice of media (standard / lamination). The UP-D25MD has a more compact design. Sony UP-D25MD has been developed to fit on modern endoscopic trolleys with a width of just 212 mm. The foot position is the same as UP-D23MD. LCD screen and keys are attached to the front panel. Any adjustments you have to make are quick and easy. 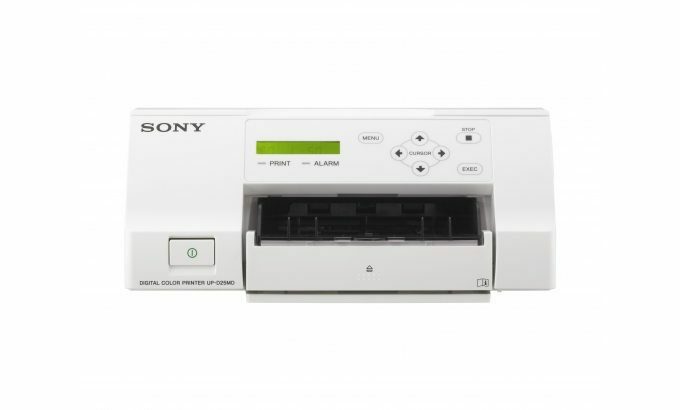 This printer produces highly durable reports that can be kept and used for a long time. Our intelligent fixed ‘ink to sheet consumption’ technology ensures you never run out of ink while paper remains in the printer. The Sony UP-D25MD allows for quick and easy replacement of consumable media (including ribbon) even in enclosed spaces. No need to access top, sides or rear. Colours on surgical screens are replicated exactly on your print-out, allowing end-users to consistently interpret events, in true colour detail. Print Size UPC-21L/UPC-24LA Size: Full 5 X3 3/4" UPC-21S/UPC-24SA Size: Full 3 3/4 X 2 7/8"
Print Speed NTSC: UPC-21S approx. 19 sec.